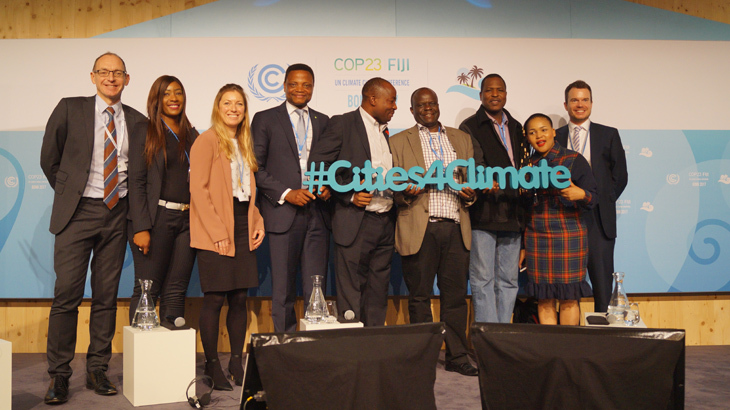 Ricardo Energy & Environment is pleased to be working with the C40 Cities Climate Leadership Group as an implementation partner for a ground-breaking project supporting nine African megacities to tackle climate change. The project, announced by C40 at the UN Climate Conference in Bonn on the 12 November 2017, aims to accelerate climate action in African cities, build local capacity, and support integration of city actions within the country’s Nationally Determined Contributions (NDCs) under the Paris Agreement. This project, ‘Cities Matter: Capacity building in sub-Saharan African megacities for transformational climate change mitigation’, is part of the International Climate Initiative (IKI). The German Federal Ministry for the Environment, Nature Conservation, Building and Nuclear Safety (BMUB) supports this initiative on the basis of a decision adopted by the Bundestag. Ricardo Energy & Environment, as C40’s main contracted technical implementation partner, will be providing tailored technical assistance and practical support to the cities, working with them over the next three years to develop transformational, robust and evidence-based long-term climate action plans that align with national climate strategies, the goals of the Paris Agreement, and support sustainable development goals. The cities that will be supported through this initiative are Accra, Cape Town, Addis Ababa, Dar es Salaam, Durban, Johannesburg, Lagos, Nairobi and Tshwane. With over 70 percent of global CO2 emissions attributable to cities and urban areas, sub-national action will be key to delivering the Paris Agreement. Limiting warming to 1.5 degrees will require identification of transformational, ambitious and robust transition pathways to 2050 and beyond. Cities often lack the technical capacity to develop long-term abatement strategies and there remains little integration of city and country-level activities, limiting the ability of cities to identify, understand and effectively target and finance the most efficient mitigation opportunities. Although sub-Saharan African countries are among the lowest emitting in the world, the region is urbanizing faster than any other. With growth of 1.4 percent per annum, 56 percent of the region’s population and 21 percent of the world’s total urban residents will live in cities in sub-Saharan Africa by 2050. Many of these cities are investing in infrastructure and setting policies that will impact development pathways for years to come. There is therefore a narrow window of opportunity to avoid high carbon ‘lock-in’ and support climate-resilient and sustainable development by mainstreaming climate change into long-term investments and planning decisions. This project is ground-breaking as it aims to support greater vertical integration between city and national governments. Whilst cities are widely recognised as having a key role to play in delivering international climate objectives, they are still not well recognised in most country climate strategies and are rarely given attention in NDCs. Identifying ways to improve ‘vertical integration’ of local and national government climate actions in African countries and cities will include identifying best practices and common challenges, so providing valuable lessons for other cities and regions. Ricardo Energy & Environment brings to the project its experience supporting national governments in Africa and worldwide on climate policy and NDC implementation. Ricardo provides transparent greenhouse gas measurement and reporting to engage and support individuals and departments across all levels of government. It works with its partners to identify opportunities for city-based actions that further enhance ambition in NDCs, achieve sustainable development goals, and accelerate action on the ground. More information on the project can be found on the C40 website and IKI website. The C40 project contact is Nicola Mander, Head of Climate Action Planning Africa (nmander@c40.org).